One of the (many) things that irritate me when I go forth among my fellow creatures is the way we can forget things we’ve learned almost instantly. A few months ago, right before the end of the school year, one of the fathers pulled up to the curb in a shiny almost-new Navigator. He was so danged proud of that vehicle, it could almost bring a tear to your eye, truly. Beautiful vehicle, but at the time I remember looking at it and thinking, Hmmm. So I looked at that shiny almost-new Navigator and thought, Whoa. 35 gallon tank, 12 miles to the gallon, gas heading over four bucks any second now…that sucker’s gonna bleed you dry, son! A few days ago, we ran into him in the gym parking lot. I was unloading the girls from Homer the Odyssey, and he was…folding down the seat of the Hyundai Accent so Junior could get out. Whoa, how the mighty have fallen...! “Hey, got yourself a commuter, huh?” I called out as our children ran screaming to each other. A lot of us do that out here, have one BIG vehicle for the family and a little one for the commuting. In fact, here in the Den we have the Odyssey for family-driving, and a Civic for anytime we’ve got fewer than four people heading out. Whoa. I bought a used Hyundai Accent about five years ago for $5,000. The idea of owing that much on a used Accent about gave me stomach cramps. My Hyundai sure was easy on the gas, though – I regularly got over 40 MPG in that little thing. Manual transmission, power nothing (which got rough, actually – you take power steering for granted until you’re doing a two hour daily stop-n-go commute without it for a few months), barest boned vehicle Hyundai had on the market. It’s sole luxury was air conditioning. While I was smiling softly to myself remembering my little bright red commute-buddy (long since donated to Habitat for Humanity, when the need for a second “commute” car vanished), he was exhibiting his stunning (and yet all-too-common) inability to remember What Had Gone Before. But as I thought about it…he’s probably right. He probably could find a buyer for the Navigator more easily right now than he could have last month, when gas was, you know, forty cents higher. The short-term memory loss humans exhibit on a daily basis is stunning, especially when we’re used to things being one way (gas is more or less affordable) and then they suddenly change (holy crap, I can’t afford to drive to the supermarket! ), and then they give a slight hint that they might consider going back to the way they were (I still can’t afford to drive to the supermarket BUT! I am a dime closer to being able to! Let the good times roll!!!!). 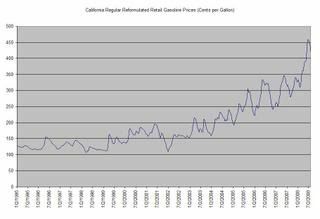 This shows the average price for a gallon of rot-gut regular in California from January 1995 to present. It spikes…and sags a bit…spikes again…sags again…but what does it do overall? That trend will reverse only when we don’t care any more – when supply outstrips demand, not just here in the US but globally. I expect the devil will need ice skates right around then. Just sayin’. And by the way – this same conversation has gone on every six months since I was a kid. Gas spikes in summer OH MY GAWD END OF THE WORLD and sags in winter whew about time those @*&^ politicians DID something about this!, and spikes again (!!!) and sags again (…). But. Do we ever, you know, learn? Do we say to ourselves, “Gee, you know what? When I first started driving, gas was under a buck a gallon…and now it’s over $4. Hmm, what does this say to me, hmm, thinking…thinking…”? Oh, no. We’re like ducks. We wake up in a brand new world, each and every day. Gas goes up, we run screaming that the sky is falling. Gas goes down, we run around screaming that we so totally should’ve gotten that Subdivision with the moon roof and the triple-play sound system, ARGH! Gas prices coming down? When did that ever happen? No, they go up and only up…wait! They came down! ARGH! I shoulda gotten that Subdivision!! I love my fellow man, I really do. I just sometimes wish we could, you know…think about tomorrow with what we learned yesterday in mind, and act accordingly today. Yeah, well, apparently we don't learn about little things like world wars or religious conflicts either. Or draw any sort of connection between an oil man in the White House, sky-high gas prices, and record-breaking profits for the oil companies. Or recognize that gas prices always fall before an election when Republicans are in office. And go right back up afterwards. Oh, boy. I'd better stop. But I'm glad I bought that scooter. I've barely been in a car all week, and I'm still on my first gallon of gas. I remember back to when I was looking to buy the Toy, the number one priority was to purchase the car model with the highest miles-per-gallon. Here's why: in September 2000 (just before the wheels fell off his predecessor), petrol prices hit 84p/litre(!) up 20p in just over a year. A good half the increase was fuel duty, plus some rise in oil/production prices plus VAT. Anyway, the truck drivers over here had had enough, baracaded the oil refineries and the country ground to a holt. Three weeks after things returned to normal, my then car started it's terminal decline. And I purchased the cheapest diesel version of the most fuel efficient vehicle on the market at that time: the Volkswagen Lupo (a.k.a. the Seat Arosa). At the time, several of my non-financially minded friends questioned my motivation, "But the fuel protests solved the problem. The price of petrol has dropped!". Yeah,right. Like it would never go up again? I'm the one having the last laugh, now. Prices have effectively doubled - when I wrote my rant ?last month, it cost me twice as much to fill the tank as it did when I first owned the Toy. And we're still getting 57 miles to the US gallon. When I buy my next car, I'll be using the same criteria as for this one: top of the list will be fuel efficiency. And may I take a moment to provide the really bad news? Hubby, who is geek enough to regard this as fun, has run the numbers regarding supply/demand/cost per barrel over the next couple of years. That upward curve is scheduled to get steeper fast. Unless demand drops a lot we will probably be paying $6 a galleon by next summer. So don’t look for a break in the cost of anything in the near future. We are looking at increases in the cost of everything that has to be transported. Which is one of the reasons I enjoy your blog so much. I’ve been advising clients for some time now to reduce their commute, use public transit and buy local; and most of them look at me like - What planet did this woman come from? It is so nice to run across someone who gets it.